Is It New If It’s New To Me? I don’t do a lot of discussion of products here, but I was in the local COOP run by university art students (their way of getting quality stuff since our artcraft store doesn’t stock it) and I came across this little sketchbook. Unlike the Cotman pads I’m used to seeing from Winsor & Newton, this one had 5×7 sheets of 100% cotton paper. I bought one and emailed W&N to ask if this was a new or old product. The response I got suggested that the guy writing to me didn’t know the product at all, though it is listed on their website. Wandering around the internet, however, suggested that somewhere around a year ago, W&N stopped making the Cotman books and started making “craftsman” and “professional” papers. 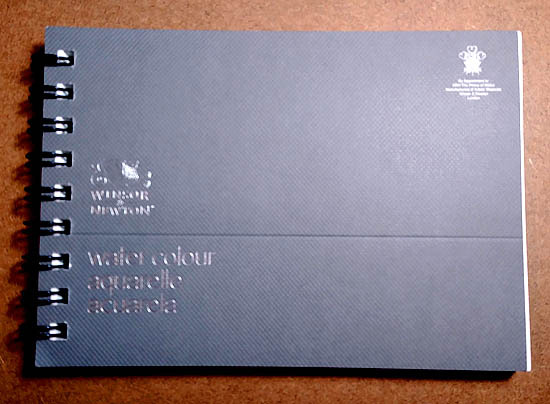 This little gray book is part of their professional series. All of this is anecdotal but what I can say is that this is completely new to me. 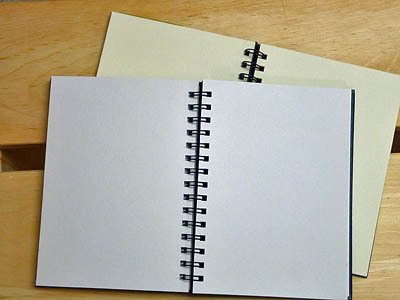 Some know Field Notes as a company that produces thin, 3.5×5.5 notepads in a series of ‘themes.’ Most of the time these notebooks come with lines, graph or dot-grid paper but once in a while they produce a series with blank pages and these are great for use as small quick-sketch notebooks. 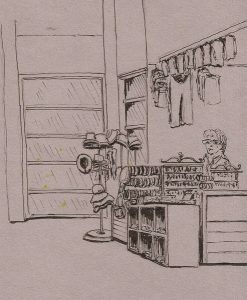 Most famous, thanks to Tina Koyama, is the Sweet Tooth series that had blank pages and came in red, yellow and blue paper books. Tina has done, by my count, a zillion or so sketches in the red ones. 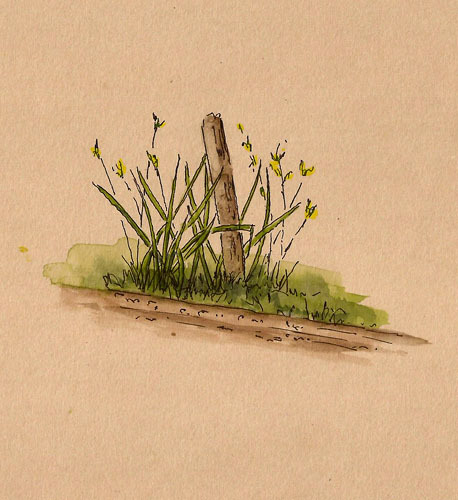 A recent release by Field Notes may be the most useful notebook yet for sketchers. 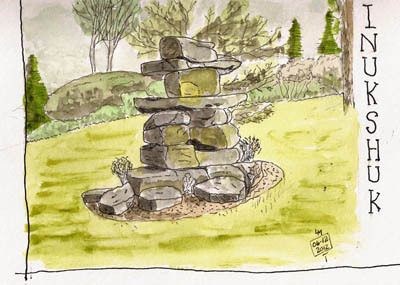 No, they won’t replace my Stillman & Birn books but for quick-sketches they’re just dandy. The release is called the Dime Novel Edition and reflects the format (4.25 x 6.5) of dime novels of the early 1900s. The paper is blank, except for a small page number in the upper right corner. Instead of their typical staple-bound 48-page form, this book has three signatures (72pages) that are sewn together and then wrapped with a heavy cardboard cover. 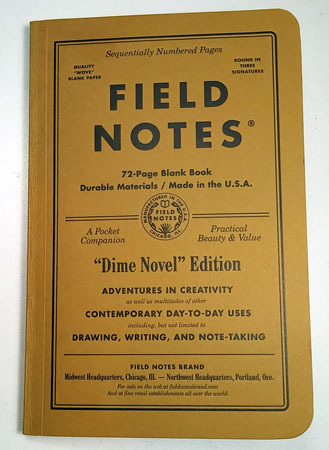 To sweeten the pot, Field Notes uses really nice 70# paper that has just enough tooth to make it nice for drawing pencils and great for fountain pen. I’ve only done a bit of testing but I saw no evidence of bleedthrough with this paper though there is a bit of ghosting. 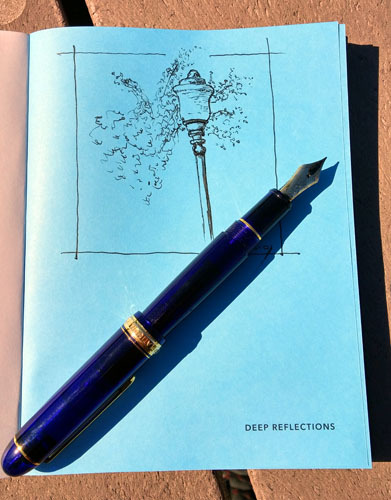 I find the size ideal, mostly because it’s very thin – about 1/4″ thick, light and yet large enough that if you draw across the gutter you have a 6,5 x 8.5 page to work on. 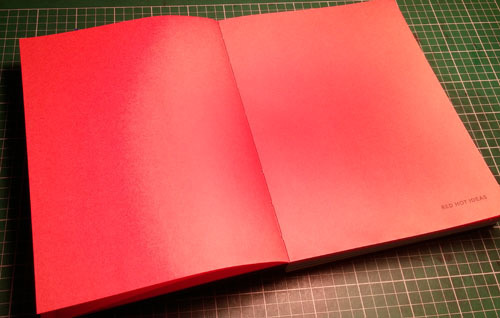 Oh…and if you go through it, pressing each page open (the book handles this quite easily), it will also lay flat. The 70# paper does limit what you can do with water, but if you don’t slop on too much water, you can use watercolor as well. 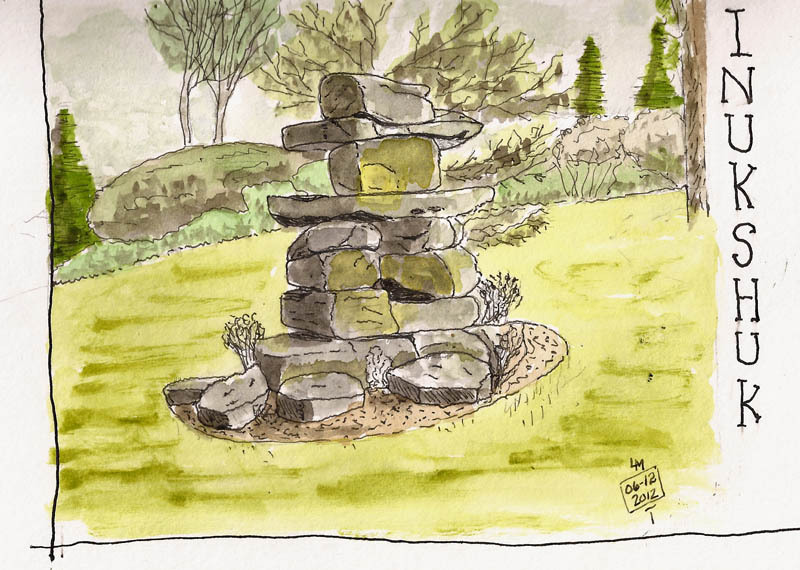 Watercolor pencils seem to work particularly well, but again, you need to keep the water applications light or you’ll get some buckling of the paper. The books are sold as a 2-pack for $12.95. Page count here exceeds the total pages contained in the 3-packs of the 3×5 Moleskine books that many use for this purpose and the paper here is far superior so if you carry such a notebook with you, give these a look. 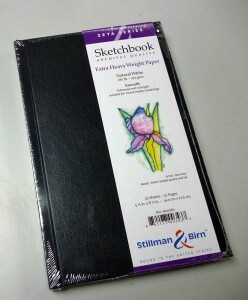 Did you get excited when Stillman & Birn announced their new Nova series of sketchbooks? I sure did. Most people know that I’m a fan of S&B but, like everyone else, when I wanted to draw on toned paper, I was stuck with 60-80lb paper with little or no sizing. 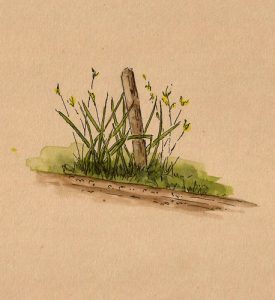 This stuff was ok for line sketching but any attempts at watercolor and the paper buckled, pigments dulled as they were sucked into the paper, and you couldn’t manipulate the watercolors the way you can on a better paper. But one day I got a call from S&B, asking if I’d like to try out their new toned paper line. I pondered my answer carefully. Microseconds went by as I came up with my careful worded response. “Heck yeah! Bring it on.” And they sent me some single sheets of their tan, gray and black papers. Which brings us to now. These papers will change the way watercolorists think about toned papers for two reasons, both having to do with the fact that physically these papers are like S&B Alpha white and cream papers. They are much heavier than other toned papers. I don’t have any data on these papers, but they are the same thickness as Alpha paper, suggesting they are around 100lb (150gsm). In any case, the extreme buckling I’ve experienced from other toned papers just doesn’t happen. The papers are properly sized, so you can actually work watercolors on them. Those who have experienced Alpha papers know that large-scale wet-n-wet is probably not the idea approach but these papers can handle a fair amount of water. The pigments can be moved around. You can charge into another color. You can lift pigments from these papers. The colorsl remain bright on these papers. I started testing by doing what I typically do with toned papers, draw with pencil or fountain pen. Very quickly I realized that this was lots of fun but not really a challenge for these papers. They were almost screaming “put some water on me,” and so I did. I’d like to provide a detailed, blow by blow on the process of getting used to these papers but, for me, it was like working on my typical Alpha and Beta papers. If anything, I might have used a slightly thicker mix to achieve the results you see but I’m not even sure that’s true. Above you can see a bit of buckling. 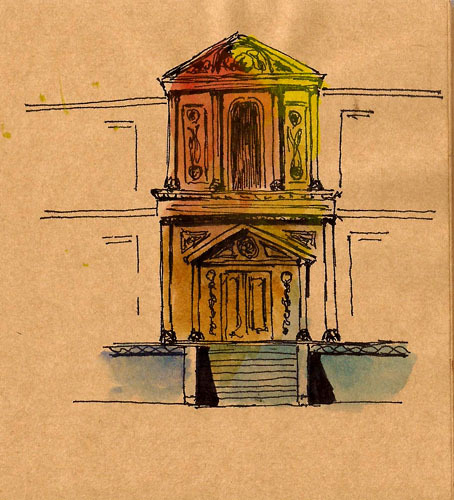 I soaked the area inside the building outline and applied the color wet-n-wet. Because the exterior remained dry this small amount of buckling took place. What I did here simply would not be possible with other toned papers I’ve used. 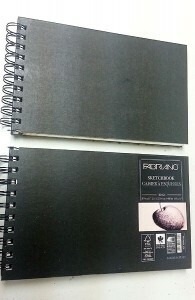 Stillman & Birn says that actual sketchbooks with Nova papers will be available sometime in August. I don’t know if that means softcover, hardcover, or both but I know I’m going to get in line to get some. Stillman & Birn will shake the world of toned papers with these sketchbooks. Thanks, S&B. Sometimes you just want to draw on colored paper. 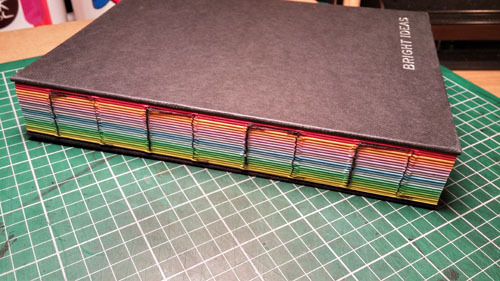 Maybe it comes from the days when we were kids and had piles of “construction paper” in all colors of the rainbow. Whatever its roots, sketchers like to shun the white and walk a bit on the wild side, if only once in a while. 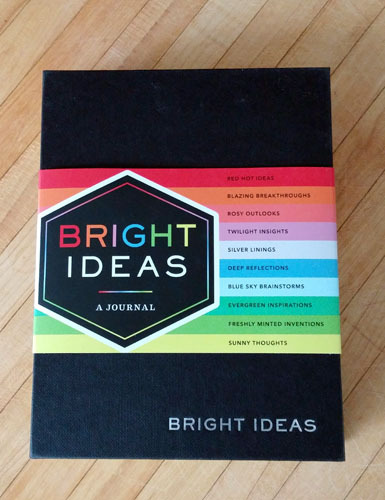 A company called Bright Ideas has a solution and it’s called the Bright Ideas Journal. This is a 5×7 book with 408 pages. I suppose you could get away with very light applications of watercolor but the paper isn’t heavy enough for the serious watercolorist. 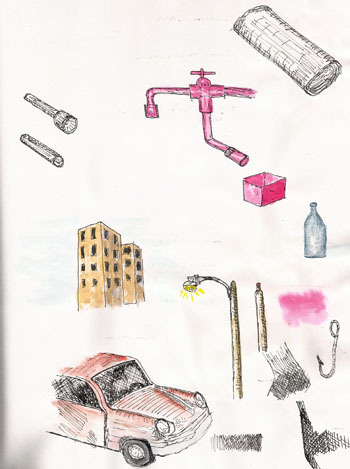 As a substrate for pencil and/or ink drawings, however, this journal is pretty sweet. It’s thick (about 1-inch) compared to most sketchbooks because of its 408 pages of paper in ten different colors but a big plus is that this book lays flat, very flat because of the open spine binding. Some may grumble because each page has the name of its section printed in the lower right corner. What purpose this could possibly serve is lost on me but I don’t find it objectionable for my ‘small sketches’ needs. I haven’t had much chance to experiment with it but the paper takes ink very well, with no feathering, no bleedthrough and ghosting only if you hold up the sheet to the light. I think I’m going to have a lot of fun with this book and I thank the Bright Ideas folks for their bright idea. I ran down to the local park and did this quick test sketch so I’d have at least one ‘test’ that isn’t a bunch of scribbles. Since I’ve been in a ‘cheap sketchbook’ rut lately, I thought it only fitting if I were to let it run its course and describe another approach I’ve taken, for when being able to stuff the book in one’s pocket isn’t important. 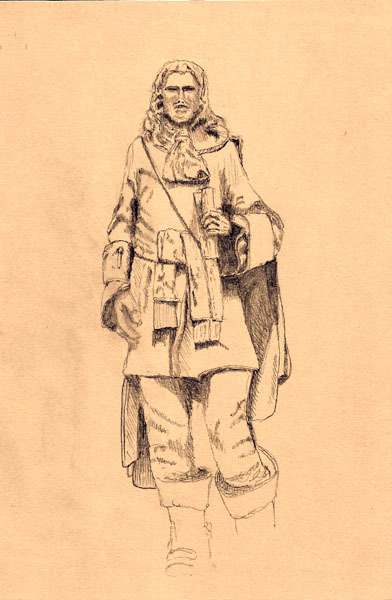 Sometimes I want to do larger quick-sketches are possible in a 3 x 5 “scribbler.” I could do them in one of my Stillman & Birn books but my quick-sketches are REALLY quick-sketches and typically they’re not very good, so I want REALLY cheap paper upon which to do them. Also, as I’m not doing watercolor I don’t need the paper quality of Stillman & Birn. 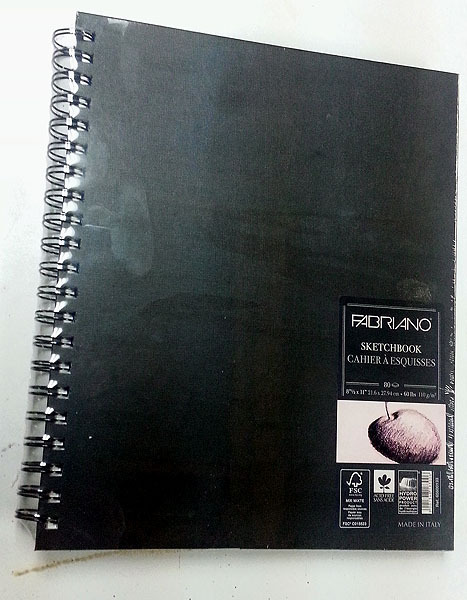 You can buy inexpensive 5×8 and 6×9 sketchbooks that have 60lb paper and are fine for such things. I’ve used Strathmore’s “Sketch” books for this purpose. They’ve got paper covers and cost $6-7 here. They’re fine. They work. Lots of people use them. Canson has equivalent offerings. But one day, while I was padding around the art store touching everything, I saw 8.5 x 11, spiral-bound, hardcover sketchbooks (60lb paper) on sale for $8. 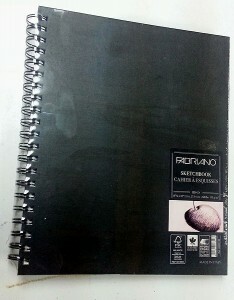 This is Fabriano’s version of an 8.5×11 sketchbook. I paid $9.99CDN for it. Sometimes they’re on sale. And I wondered. I wondered enough to buy one. I wondered enough to take it home and go into my dungeon, err, workshop. I even wondered if I was nuts for doing it but a few seconds later I’d run that sketchbook through my bandsaw, creating two 5.5 x 9 sketchbooks. If you don’t own a bandsaw, I bet you know someone who does. Cutting them does leave bare cardboard edges on one side of each book but that’s easily fixed with a fat Sharpie marker. When bought on sale these cost me $4 each and provide 160 sheets of sketching fun. One caveat about the cutting. You can cut right through the spiral binding and it will generally work (depends on saw and blade I suppose but even my wood blades worked fine). The potential exists, though, that the spiral will get bent at the point of the cut. It’s really easy, though, to use some wire nippers to cut the spiral in the middle, removing a small section of it before cutting the book. Otherwise, this is one of those no-brainer thingies that one can do to produce nice quick-sketchbooks in a more typical size than the ones I’ve been talking about recently. 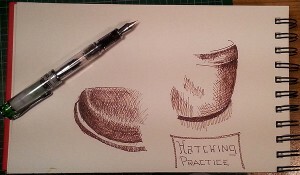 Here’s some lines I made in such a book while watching Paul Heaston’s class on Craftsy. Yvan and I use these all the time when we go to music recitals or quick-sketch in places where we’re carrying our art bags and don’t have to worry about being inconspicuous as we sketch. Give it a try. Well, nearly two years and ten S&B sketchbooks in use or filled, I think I can be a bit more definitive…but with another caveat. 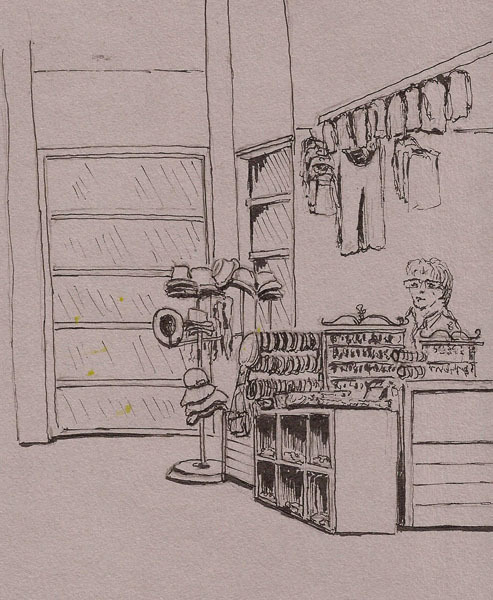 Stillman & Birn just keeps getting better and better so who knows what ‘best’ will look like in the future. 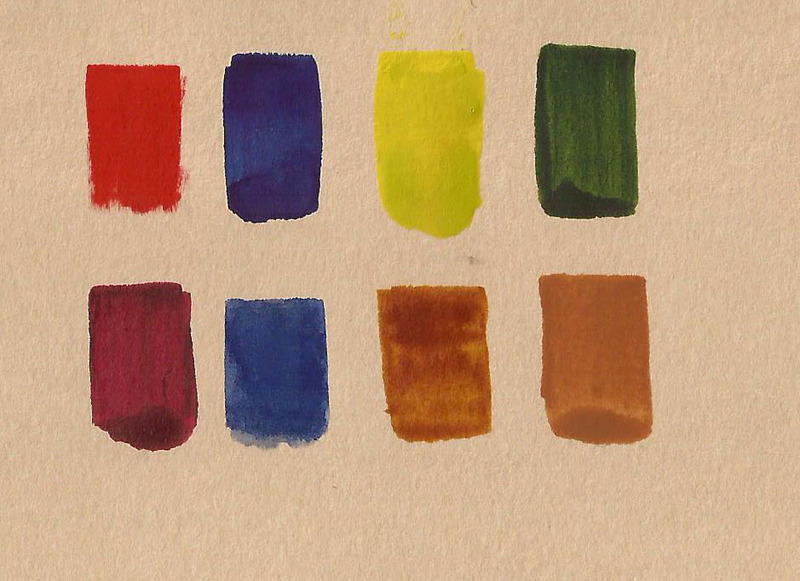 I find the colors are brighter on Zeta paper, probably because they aren’t absorbed into the paper as much. Makes lifting easier as well. 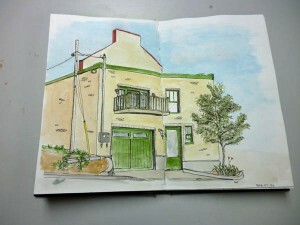 As I filled sketchbooks, I tried the other Stillman & Birn papers. 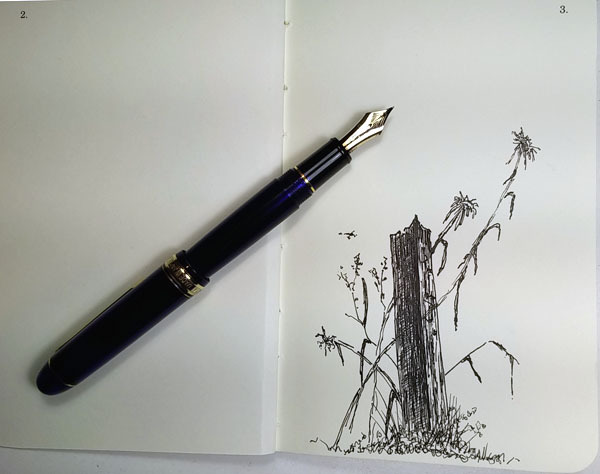 For the pen & ink work I do, the Epsilon sketchbooks are wonderful to draw on. It took me a while to get used to how the smoother paper accepts watercolor as they stay wet longer and sit on the surface more, which is neither good or bad but different from the more absorbent Alpha. 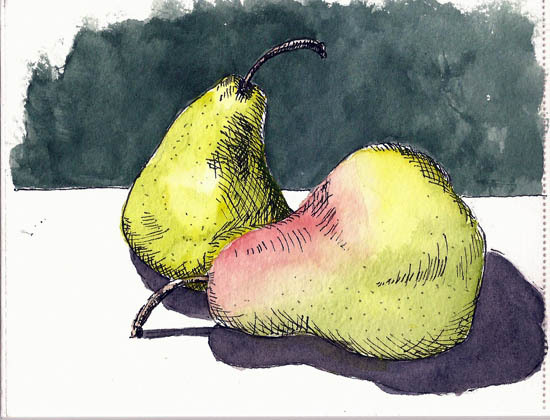 The best equivalency I know is to the differences between cold-press and hot-press watercolor papers. Both of these papers are 100lb papers that, while they outperform any papers of this weight I’ve ever used, they still have a tendency to curl somewhat when lots of water are applied. You can see a bit of shadowing if you use both sides of the paper. 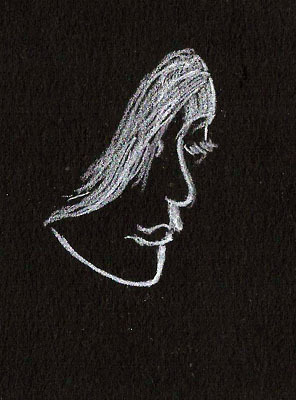 And then I tried Beta, S&B’s 180lb paper. 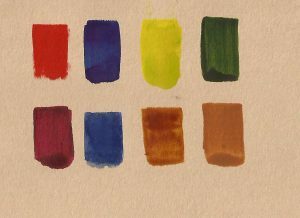 This is surfaced very much like a cold-press paper and provides a fantastic surface for watercolors but not as nice as Epsilon for pen use. 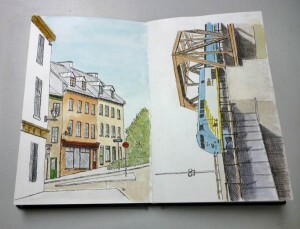 By the end of the summer of 2012 I wrote a summary post on these different sketchbooks. I was completely hooked on Stillman & Birn papers and their amazing double-stitched bindings which are second to none. But at the time I thought “They need thick “Epsilon” paper. Notice how flat S&B Zeta sketchbooks lay once they’ve been broken in. And this is the thing about Stillman & Birn. If you dream it, they magically know you were dreaming and they make it. The Zeta sketchbooks were release a few months ago in response to my dream. I’m betting others were dreaming the same thing. I use several S&B sketchbooks (different sizes and papers) simultaneously and when the Zeta series was released, I immediately started using one. 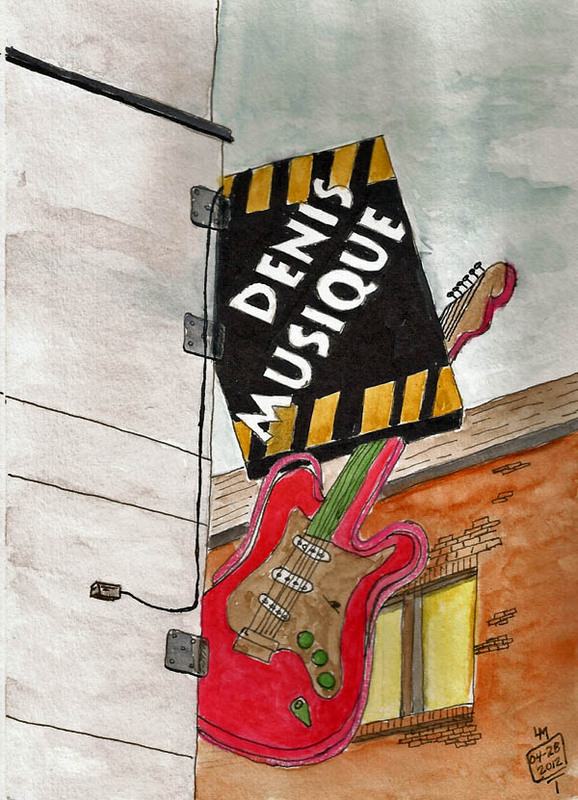 It quickly became a favorite for my kind of sketching (pen/ink and wash). It’s a merging of best of Beta and Epsilon into one paper as it’s 180lb Epsilon paper. I’m working in my second Zeta sketchbook and it’s hard for me to see any reason to use any other, if the size I want is available with this paper. There lies the rub as I still use Alpha in 4×6 and 10×7 formats. 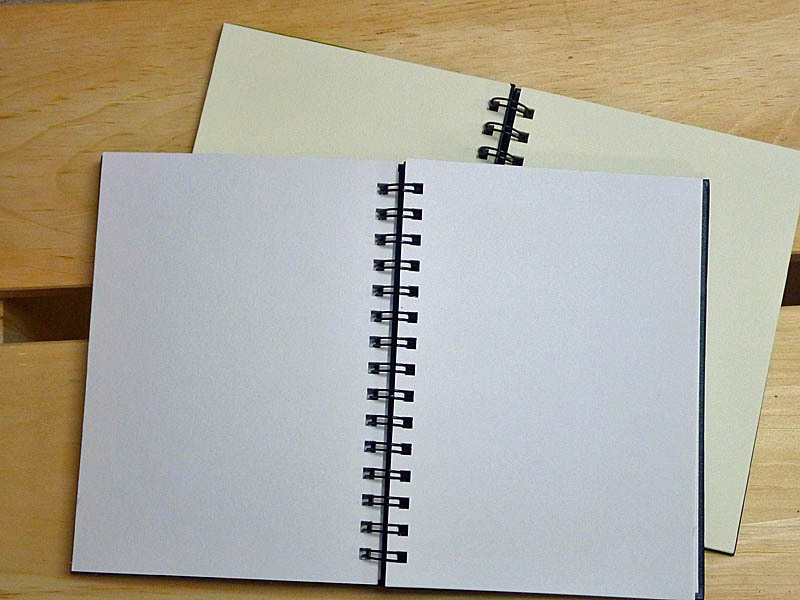 I will likely buy a 7×10 spiral bound Zeta as a substitute for my 10×7 Alphas but, so far, S&B haven’t produced a truly small sketchbook (thin, 3×5) – my current dream. I hope that when they do it will contain Zeta paper (grin). 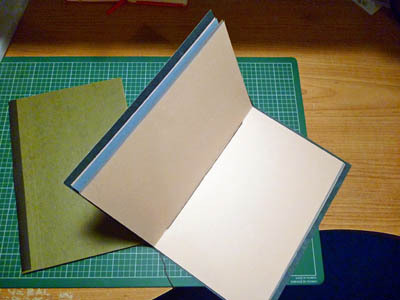 There are dozens of videos and blog posts demonstrating how to make sketchbooks. This isn’t really one of them. Then again, it sorta, kinda, is. 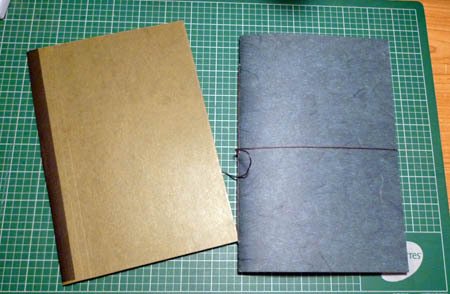 I’m writing it because I mentioned that I’d made a couple small sketchbooks using brown paper in the Facebook group, Artist’s Journal Workshop. One of the regulars in that group asked if I could show how I made them. This post is what you might label a “Cliff Notes” (does that date me too much?) 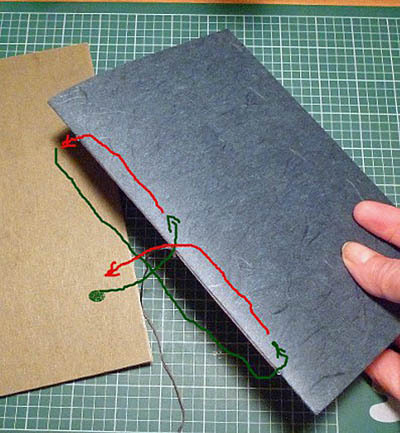 version of how to make a simple sketchbook. I encourage you to surf through the YouTube videos for better explanations. These are the two sketchbooks I’ve made. Both are identical in construction. Both are 5.5×8 in size. The one on the left contains brown pages, cut from plain, cheap postage wrapping paper. I find this paper works well for pen drawings and you can even add light washes but it’s not very happy with too much water, however. 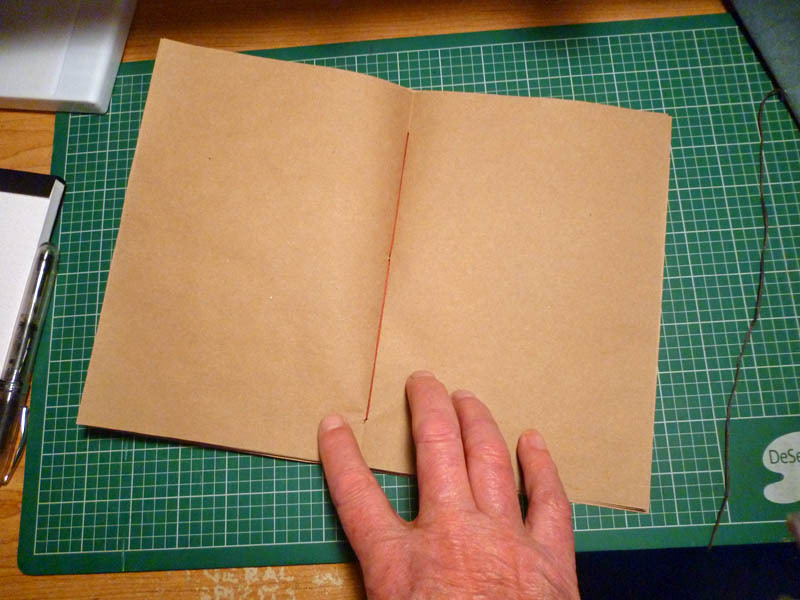 The cover of this sketchbook is made by cutting a file folder to size. The benefit of this approach is that it’s already folded and the material is designed to act as a cover. In short, it’s ideal and easy. The binding tape (optional) is gaffer’s tape, a black, a fabric tape used to hold everything and anything together. Think of it as a heavy-duty masking tape, which could substitute for this purpose. 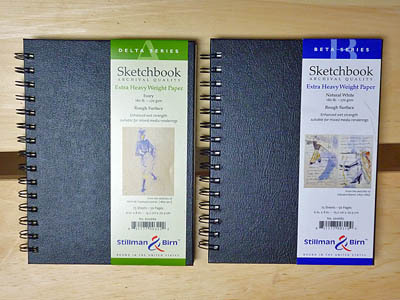 The second sketchbook is composed of several colors of Canson mi-teintes paper. 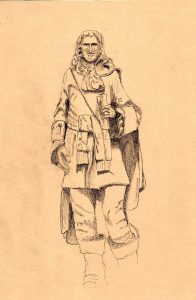 I believe this is listed as a pastel paper but people use it for pen and watercolor sketches as well. It’s not quite as smooth as the brown paper but it’s much thicker. 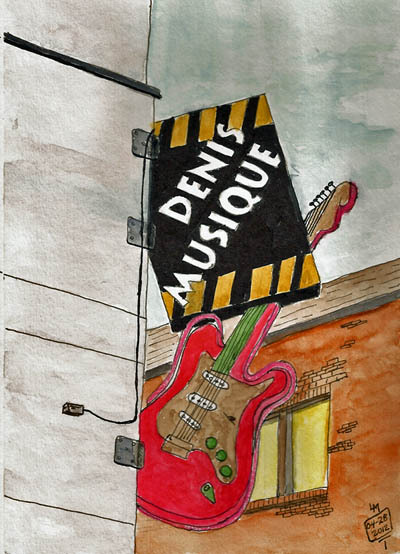 The cover comes from a 12×12 sheet of heavy, patterned paper I got in the scrapbook section of the art store. Besides the paper materials, what tools are required? To make a 5.5×8 sketchbook, you need a bunch (I used 6) of paper squares cut 11×8. I’ll leave you to your devices to achieve this. Then you need to fold each sheet so that you have a two-page signature leaf that’s 5.5×8 inches. 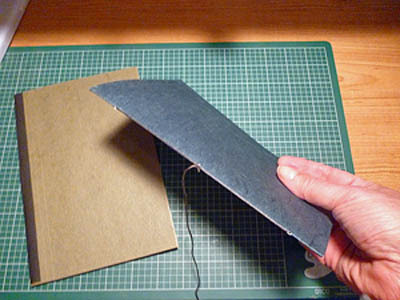 Use something hard and with an edge to crease the fold as tightly as you can. I found it desirable to actually iron (low heat) the brown paper pages as the paper came off a roll and tended to retain that curve. Once you have these pages, simply stick them, one inside the other, creating a single, 12-page (or 24 if you count both sides) signature. The inner pages will stick out slightly beyond the outer pages. Trim them if this concerns you. If you’re using a file folder for your cover, just cut it to fit around the paper. Otherwise, fold your cover stock in half and cut it to fit around your paper. That’s all there is to making a cover. There are lots of fancy ways to sew up sketchbooks. This ain’t one of those ways. 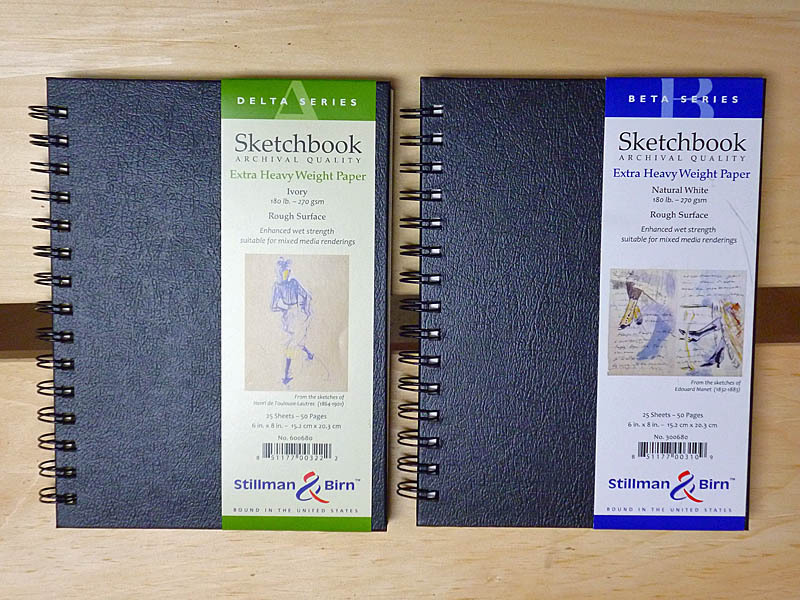 My goal wasn’t to replace my beautiful double-stitched Stillman & Birn sketchbooks. 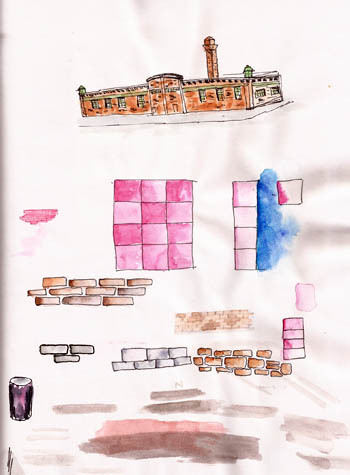 It was to tie a few pages of colored paper together so I could sketch on them. So…easy-peasy…we don’t do hard. Before we get started, notice that there are three holes in the spine of this sketchbook. These are punched before we sew. Make the holes a bit larger than your threading needle to make the sewing easy but not so large that things get sloppy. 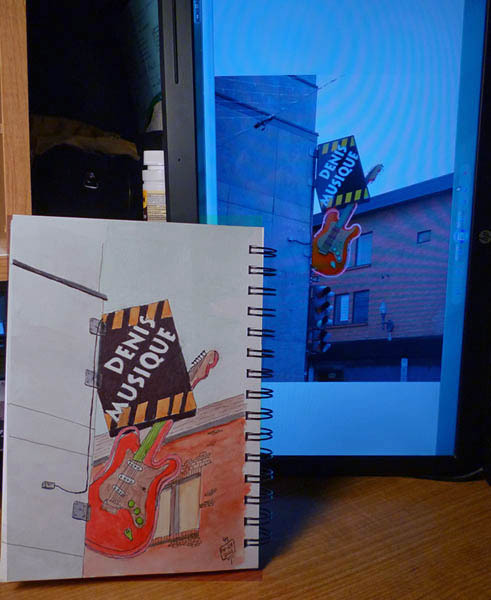 Punching those holes could be considered the ‘hard part’ but remember, this is easy-peasy sketchbook making. Get out your phone book and flop it open on a table. Open your sketchbook to its middle and stick the spine into the centerfold of phonebook phone book. Take your sharp thingie (you chose your tool), and stab through the entire sketchbook halfway down from the top and through the fold of the sketchbook. The phone book will hold everything in alignment and provide a place for your sharp gizmo to exit. Easy peasy. Now repeat that process an inch from the top and an inch from the bottom. Voila, the “hard part” is done. Let the sewing begin. Use whatever thread you like but it should be fairly thick. There are special bookbinding threads available but I just used several strands of cheap embroidery thread and a large embroidery needle. There isn’t much to this…really. It’s harder to explain it than to do it. I’ve made a crude drawing of the thread path as an attempt to eliminate the proverbial 1000 words a picture replaces. The green arrows are when the thread is outside the book; the red arrows indicate the thread inside the book. There is one thing to note. The thread going into the center of the book, and the thread coming out of the center of the book, should be on opposite sides of the long run of thread that goes from top to bottom on the outside of the book. Once you do this threading, just grab the two ends of the thread and pull everything tight. Then, tie a double knot in the two ends. Notice that this will cinch down on that long thread running along the spine. That’s why the ends need to be on opposite sides. I hope that is more clear than it sounds (grin). Cut off at least one of the loose ends. Whether you cut the other end depends upon whether you want a long end to wrap around your sketchbook to keep it closed. I did this for my mi-teinte paper book because this thicker paper doesn’t want to close completely flat. I cut both ends on the brown paper sketchbook and then covered the entire spine with tape. I think this actually provides a better, cleaner solution but to each his/her own. So there you have it – how I made a couple of quicky sketchbooks. Hope this helps someone.